Warning signs are something that we believe in, especially when it comes to your roof. Believe it or not, but there are so many ways that your roof is telling you that it’s time for a new roof, whether you choose to see them or not. In the middle of winter, your roof is doing a lot of work. From keeping you nice and warm inside to shielding you from the harsh weather that mother nature sends our way, there are so many reasons to be thankful for the work your roof does. Given that our roofs are working so hard during this time of year, it’s not uncommon for them to start showing signs that it’s time for a new roof. Between the high amounts of water and any prior damages that went uncared for, you may start to see more signs that it’s time for a new roof during this time of year more than any other. 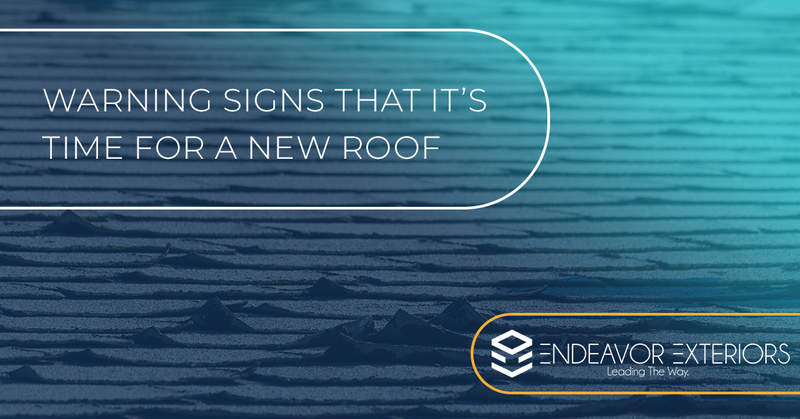 Not sure what types of signs your roof might be giving you? Keep reading, we’re about to cover some of the most commonly seen signs that it’s time to get a new roof. While somethings age with time, your roof is not one of them. In fact, the older that your roof is, the more damage it has likely been exposed to. This is the first sign that it’s time for a replacement. If you’re thinking to yourself that your roof is on the older side, but it hasn’t caused you any problems, there’s more that you need to consider. An older roof may not have any water leaks that you need to deal with, but it could have leaks that are letting out air and causing your electric bills to rise. For those of you thinking that a new roof is going to cost you more than the efficiency of a good roof, think again. You’ll save so much money by having a new roof with no leaks! Your shingles are going to be one of the easiest ways to determine what your roof needs. Whether you have shingles that are warped, cracked, or entirely missing, this is a clear sign that it’s due time for a new roof. The shingles are the piece of the roof that protects your home from all of the weather that comes your way. Needless to say, it’s pretty important that your shingles are in good condition in order for your roof to do its job properly. Depending on the conditions of your shingles and the rest of your roof, it might be as easy as going through and simply replacing the shingles that are damaged or missing. The best way to find that out is by contacting your local roofing company and having them come out to inspect your roof. The most common reason that people call for help with their roof is because they have a water leak. Unfortunately, it takes quite a bit of water for there to be an obvious leak within your home. Not only does water need to make its way through a crack or opening in your roof, it needs to work its way down through the attic, and build up enough to create a puddle of water. From there, the water still needs enough time to be absorbed into the wood and then create a leak. Usually, when people contact us about a leak, there’s some bigger work that needs to be done. The work that needs to be done will all depend on how long the leak existed before it was cared for as well as how much damage was done in that time. This is another instance where a roofing contractor is going to be able to give you a clear idea on how much work needs to be done on your roof in particular. We’ve just finished covering three of the major signs that your roof gives you when it’s time to inquire about a roof replacement, but there are instances where a roof gives no warning at all. In those cases, it’s having a knowledgeable individual inspect the various factors that contribute to how well a roof is doing its job, and that’s where we come in. Endeavor Exteriors is a team of roofing contractors with years of experience. We strive to provide the Denver area with high-quality roofing services that make every step of the process an easy one. Our one-of-a-kind software makes it easy for you to stay up to date on your project and see the progress that we’re making. Contact our team today to schedule an inspection or if you have any inquiries about a new roof installation.